Today’s bike club ride was our old route up Turnbull Canyon in Whittier. We’ve done this one many time before, so there’s not really anything new along the way. Just a few odd sight’s. At the park where we meet, I picked up a potato chip bag that was on the ground. I took it over to a trash can, and I noticed a prescription bottle on the picnic table next to the trash can. 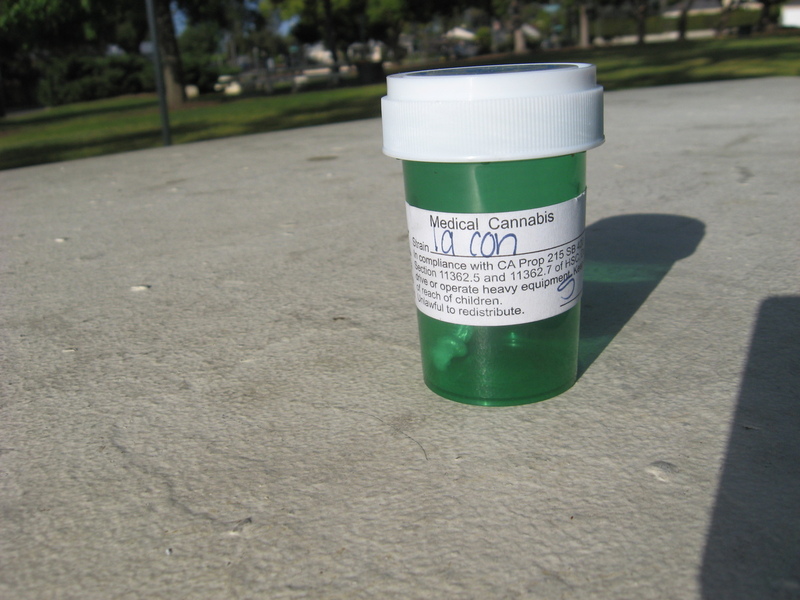 I thought that was bit odd, so I had a look at it, and it was a medical marijuana prescription bottle. That was a bit odd, and it was certainly something I never would have thought I’d see just a few years ago. But it was empty, so I tossed it. 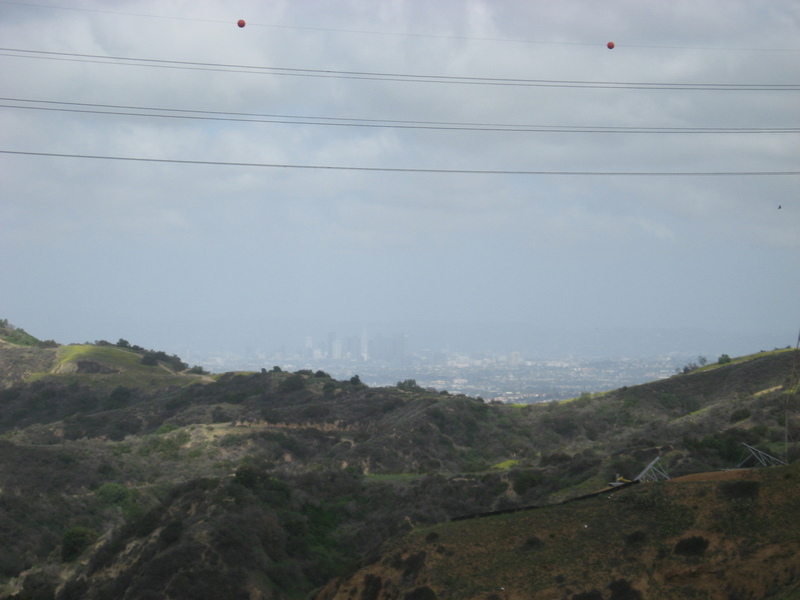 The ride was pleasant enough, although it was kind of hazy, so the view of downtown Los Angeles wasn’t very good from the top of Turnbull Canyon. I couldn’t even point out the Wilshire-Figueroa building and tell everyone how I’d climbed that building 101 times! We headed down the other side, and then rode back home by way of Monrovia and Merengue. 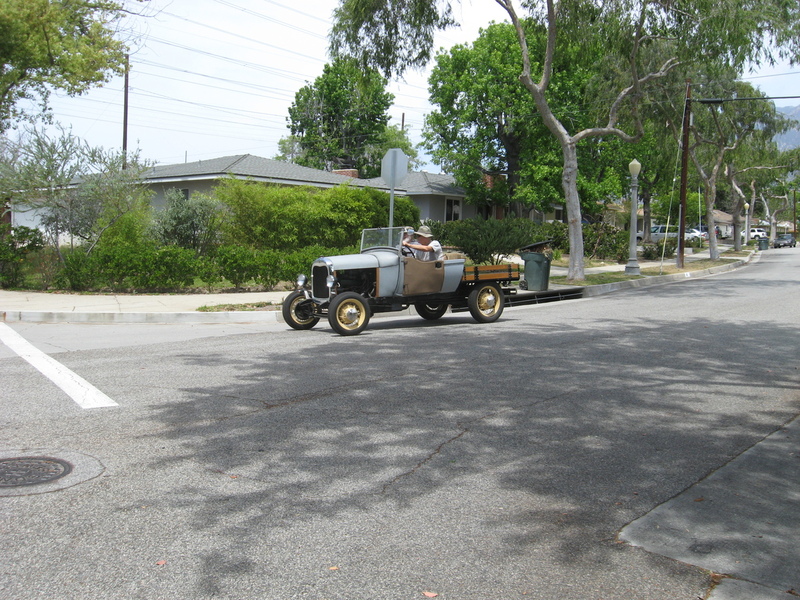 And then back to Pasadena, where we saw some guys cruising the neighborhood in an antique car. As always, this route is longer than I think it is. But it’s a nice ride. The route was almost exactly the same as the Metro Rail Tour we did a few weeks ago. The only difference was that we weren’t doing it this time with the intention of bailing out and taking the train home, since the weather was really quite nice, and there was no chance of rain. We rode into downtown and stopped to look at the foundation of the former building. The article had said they’d started demolition on it, but it looked about the same as it’s looked for the last 30-mumble years since I first saw it. 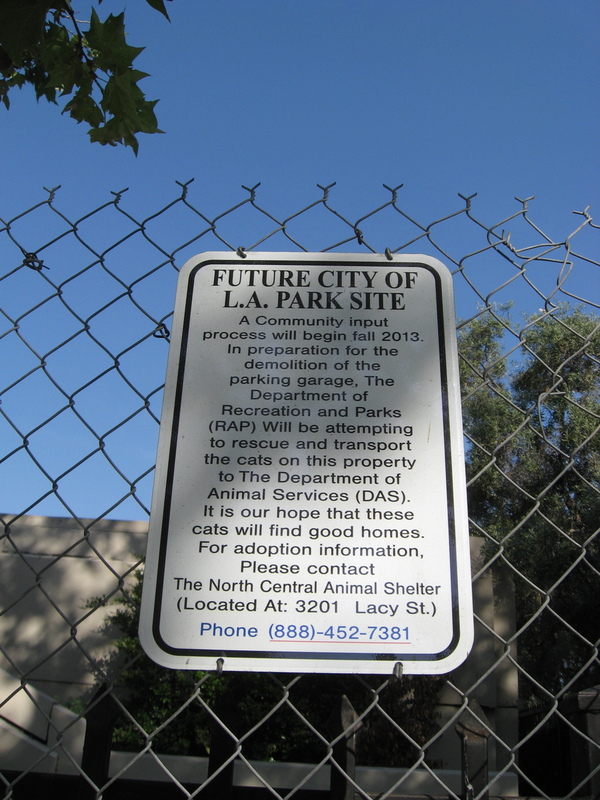 Still, there was a new sign about how it was going to become a park, so I guess that’s a good thing. 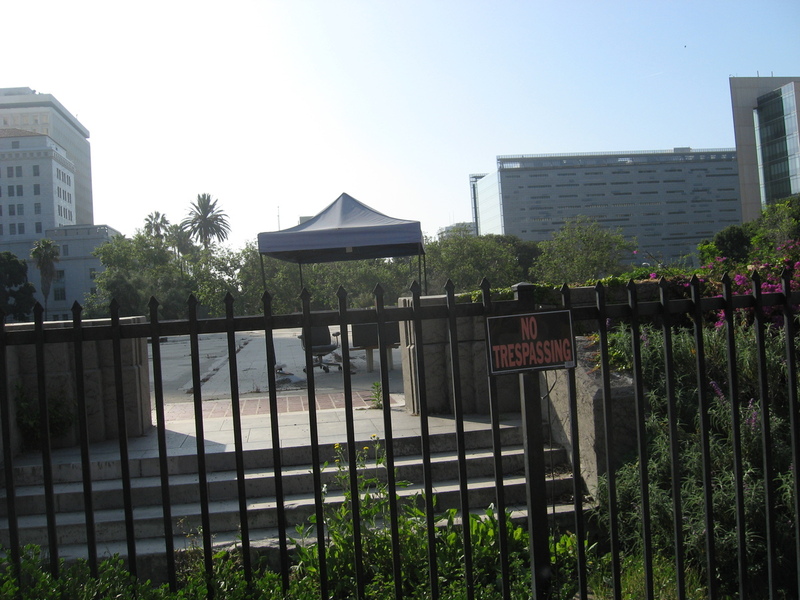 After that, we rode over to the site of the new Wilshire Grand hotel. We’d stopped by there recently to see the foundation that they’d made for the new building, so we were curious to see what it looked like now. The building is supposed to be very tall. Almost as tall as the tallest building in Los Angeles. (They keep saying it’s taller, but that’s just because the architect put a spire on the roof. It really doesn’t count unless you can stand on it.) They say it’s supposed to be engineered to withstand the strongest earthquakes here. I suppose we will see. 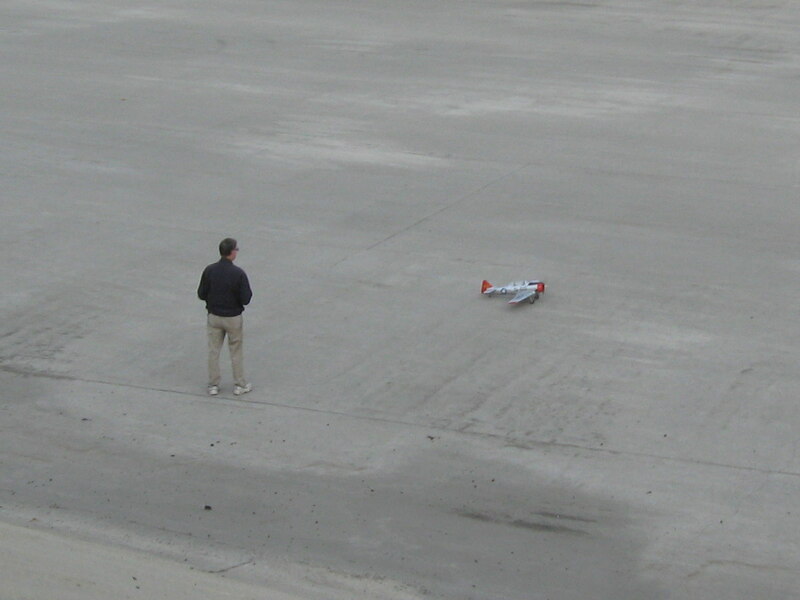 Someday, it will be tested. The rest of the ride was just our normal route through Koreatown, Larchmont Village, and then home through Chinatown and Lincoln Heights. It was a nice ride. 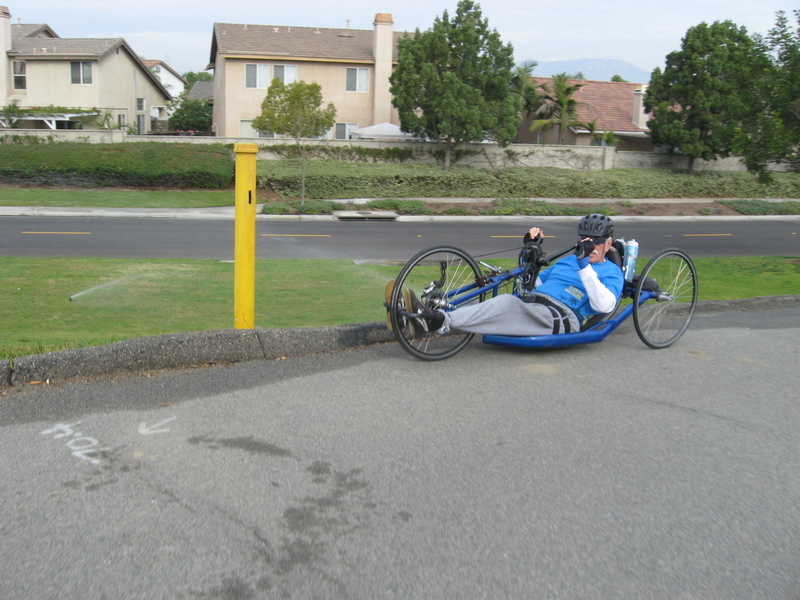 Today’s bike club ride is our old route out to Glendora. 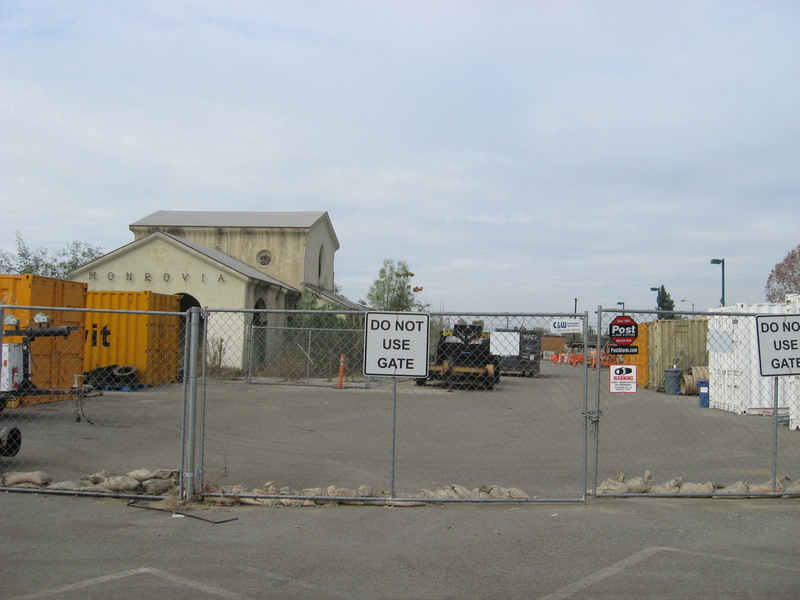 Nothing special, but a chance to look in on the construction of the Metro Gold Line extension in Azusa, and also to go by the Huy Fong Foods hot-sauce factory in Irwindale. 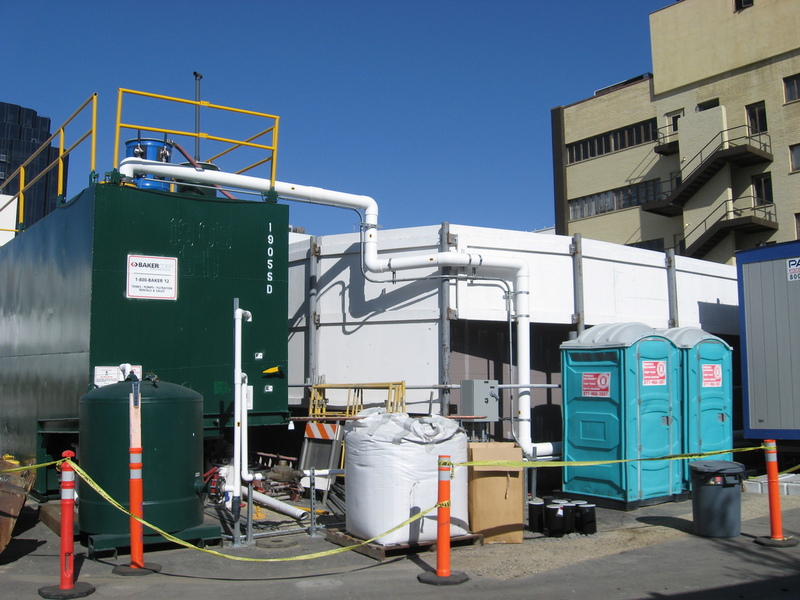 The city council in Irwindale is thinking of declaring the factory to be a public nuisance, since a few of the people in the neighborhood don’t like the smell of the factory. It was a cool spring morning, just about perfect for riding. We headed out to the east. 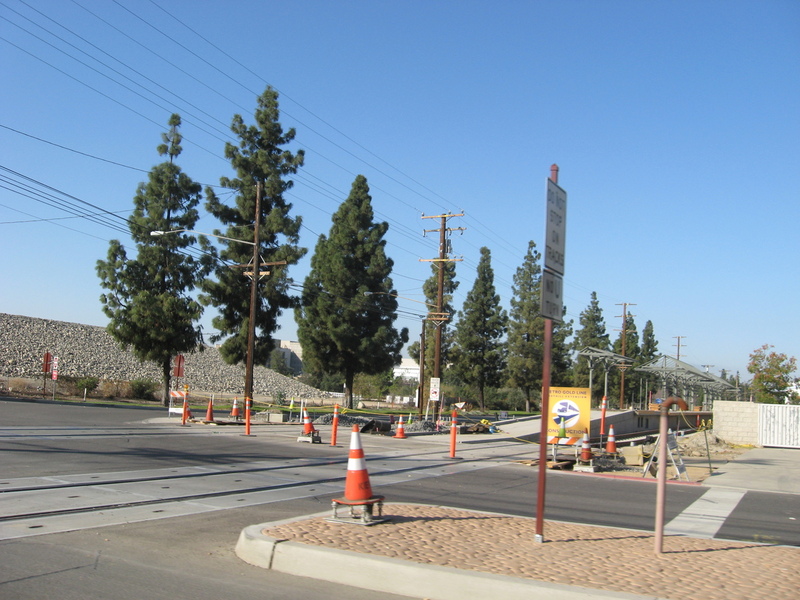 When we got to Azusa, we took a short detour to go see the construction of the new Metro station. They are making good progress since we went to see this in February. 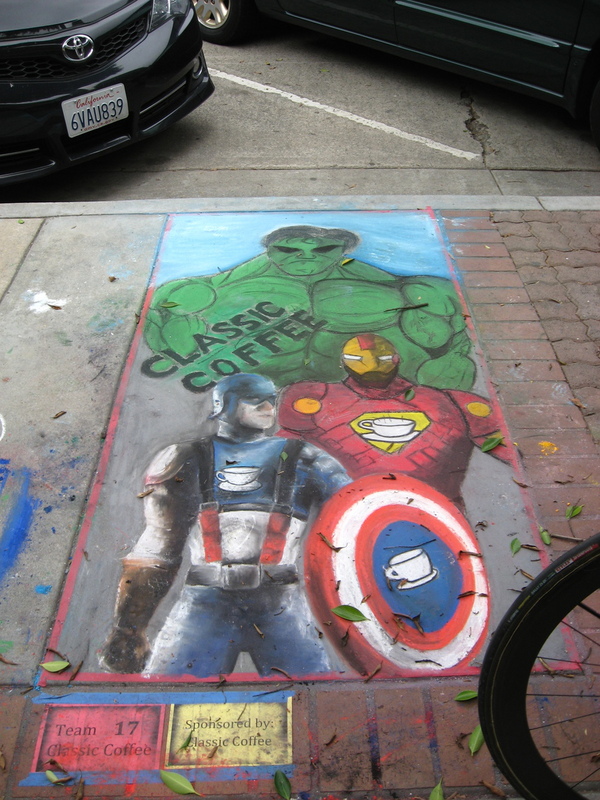 We stopped for coffee and snacks in Glendora, and we had a look at the chalk art drawn on the sidewalks there. 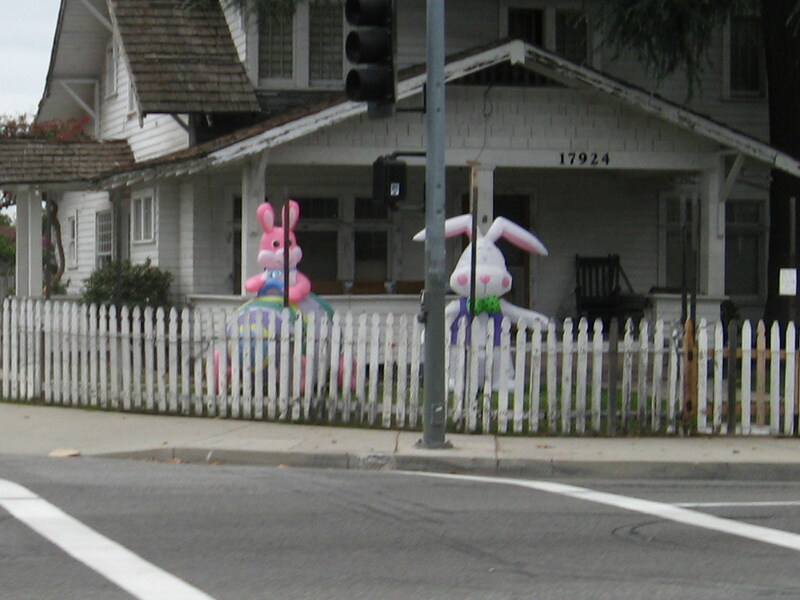 Then we headed back, passing by some giant inflatable rabbits in front of the the same house that had the giant candy canes and Christmas ornaments in the past. Then we rode by the enormous Huy Fong Foods hot-sauce plant. 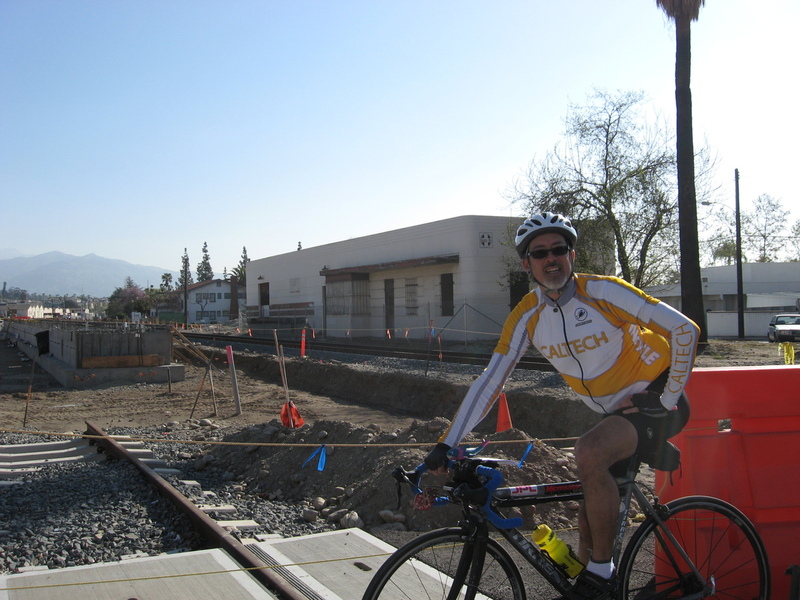 Then we took in some more of the Gold Line construction in Duarte and Monrovia. All told, it was a pleasant ride. 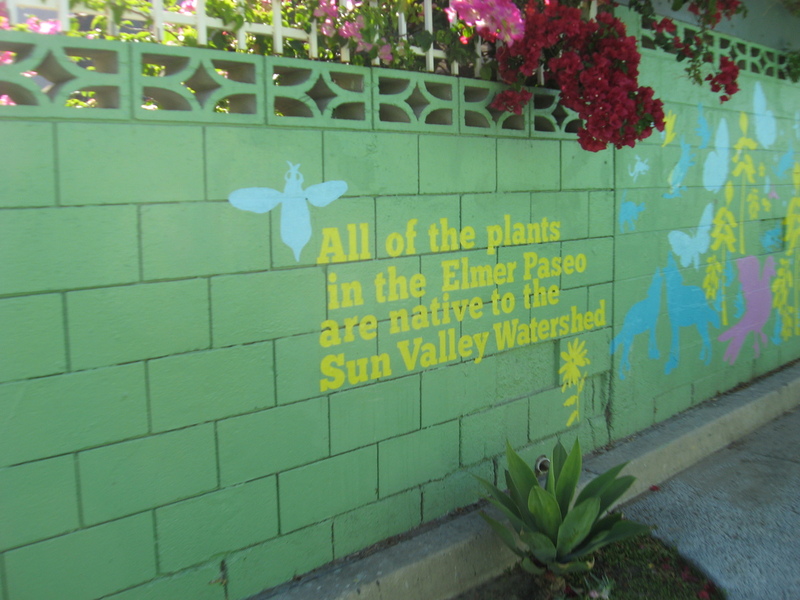 Last month, when Kathleen and I took the tour of “The Crappiest Place on Earth“, there was a display in the visitor center about the Los Angeles “Green Streets” program, with some photos of their demonstration project on Elmer Ave in Sun Valley. And of course, my first thought was that we were going to get a bike ride out of this. I looked it up, and it’s just a bit northwest of Burbank Airport. And we’ve ridden there before to see the World War II bombers, among other things. 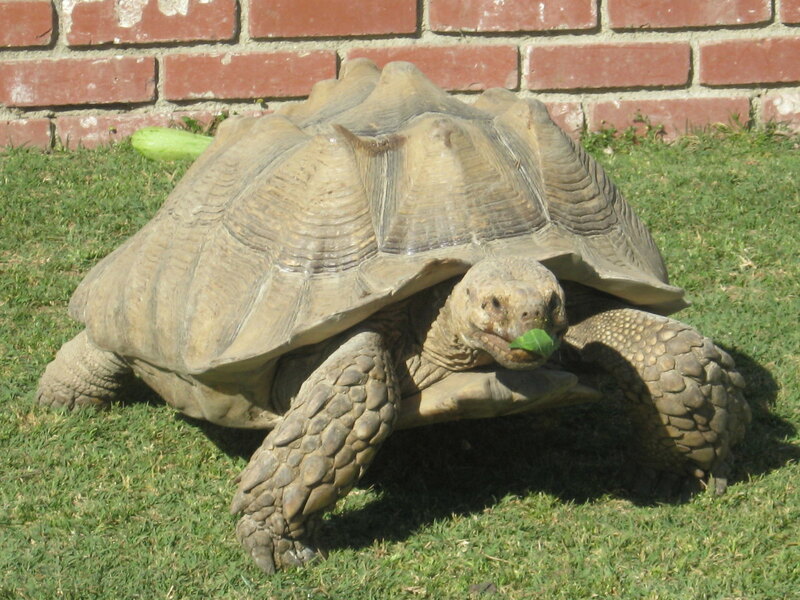 On the way out there, we stopped by to see the desert tortoises in Burbank. The guy who owns the house came out to feed them and talk to us. He was feeding them some small squashes and a head of cauliflower, and they seemed pretty excited by that. Sort of like when I saw the slow-motion feeding frenzy at the Caltech turtle pond. 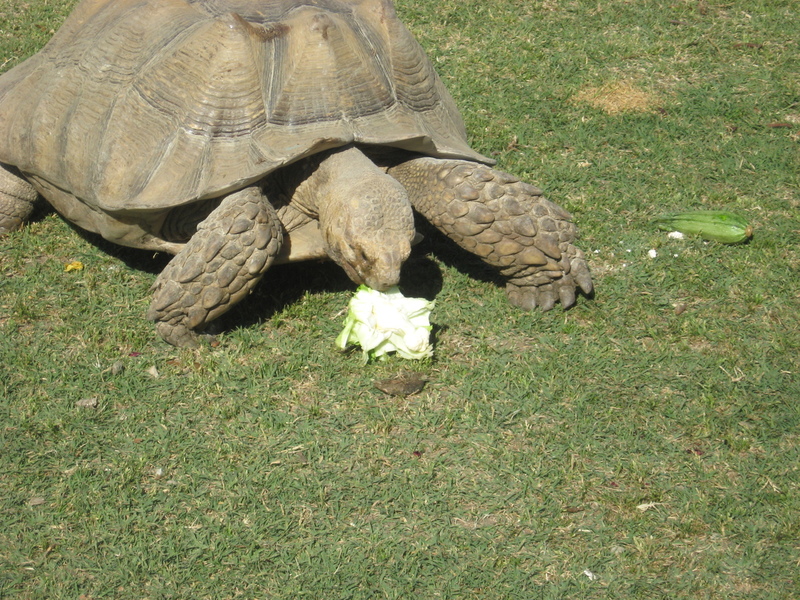 He also said that the tortoises sometimes mate, and that’s apparently a sight to see. 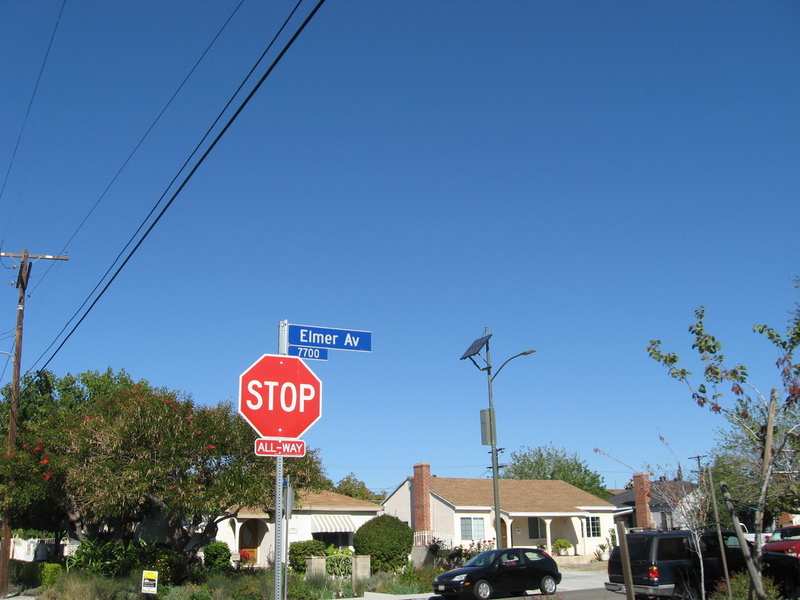 Continuing on, we went by Burbank Airport and on into Sun Valley to Elmer Ave. And yes, it looks like a demonstration project. 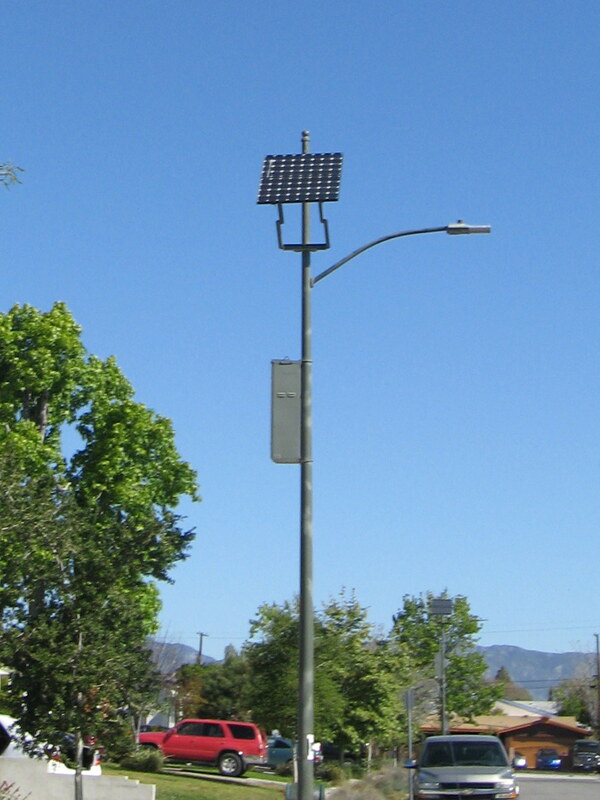 Solar-powered street lights, basins to catch runoff, permeable driveways, and barrels to catch rainwater. 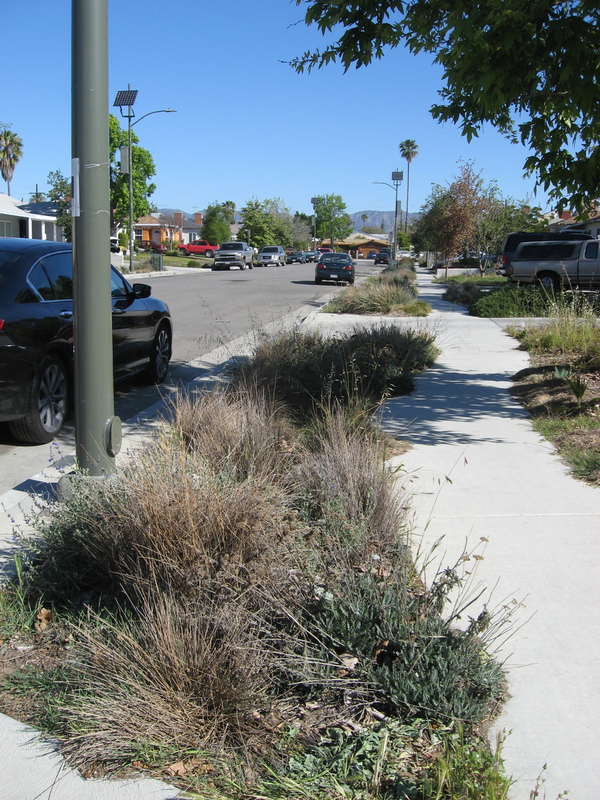 I made me want to join up for the Pasadena Turf Removal Program. After that, we headed down to Priscilla’s for snacks. The route home went across Glendale. We were going to take the pedestrian bridge over the Glendale Freeway, but at the last minute, we decided to try going across the freeway on Round Top Ave. I thought it might be a bit shorter, and that it might avoid the hill that we have to ride up after crossing the freeway. It did avoid that hill, but only at the cost of us having to ride up an even bigger hill. So that route experiment was kind of a dud. But at least it was a nice day for riding. 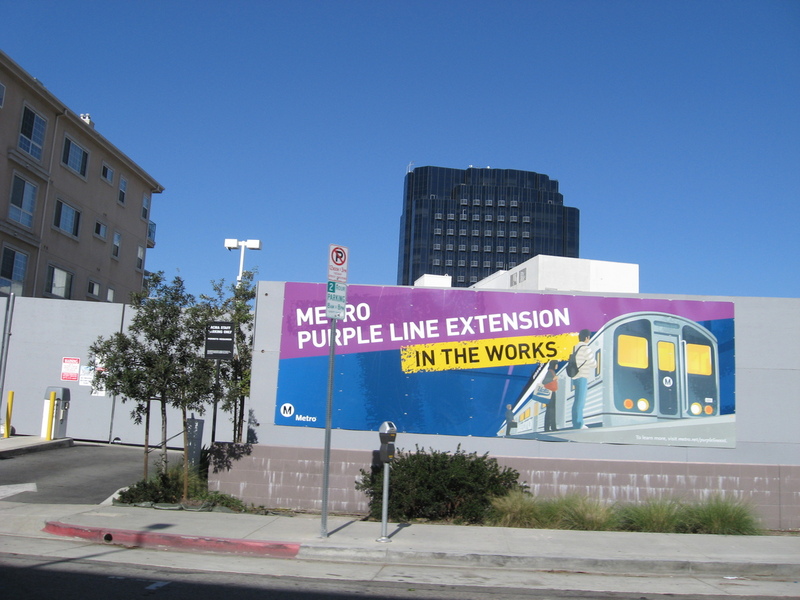 There was an article in the L.A. Times this week about a pit that Metro is digging along Wilshire Blvd to prepare for the Fairfax station on the extension of the Purple Line subway. 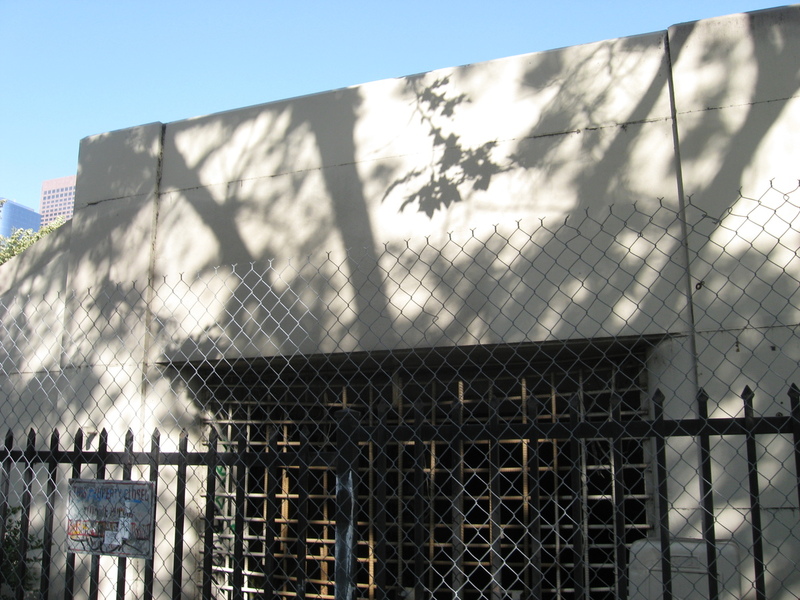 The location is right across the street from Hancock Park and the La Brea Tar Pits, and the article talked about all the fossils they were finding there, on what had been a beach during the last Ice Age. So of course, I thought this might be interesting to go see, although I thought that there was a good chance we wouldn’t actually get to see into the pit. 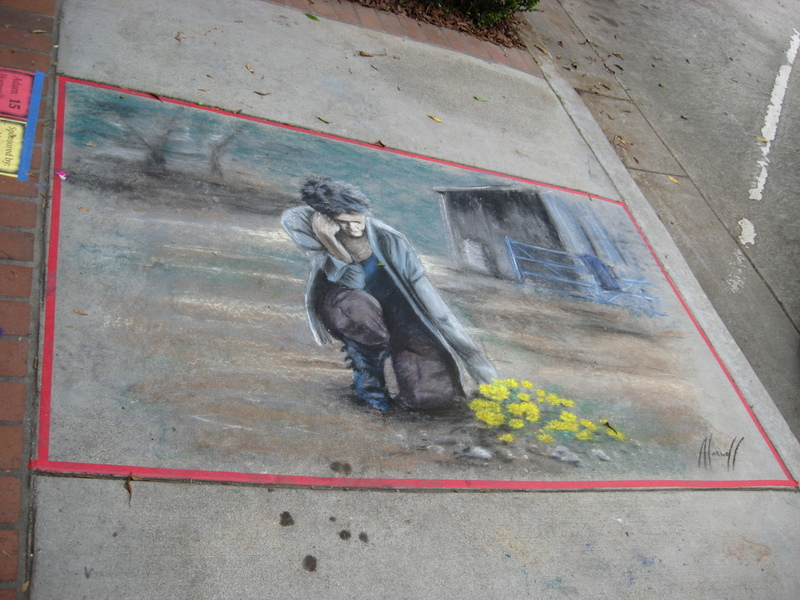 Still, it’s just another interesting bit of local color, even if that color is all black from the tar. 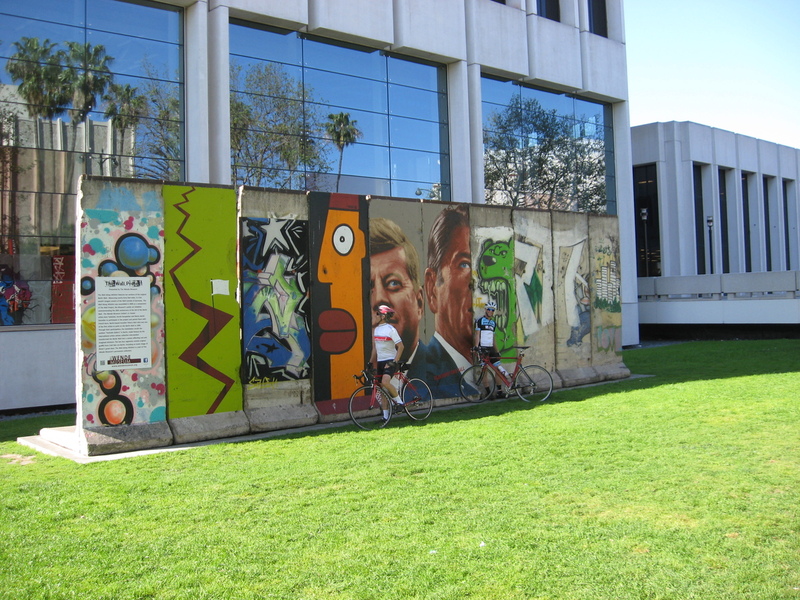 We rode out by way of downtown Los Angeles, and then out on 9th St and 4th St to get out to Park La Brea. Along the way, we saw one old brick apartment building that looks like it’s been reinforced for earthquakes. 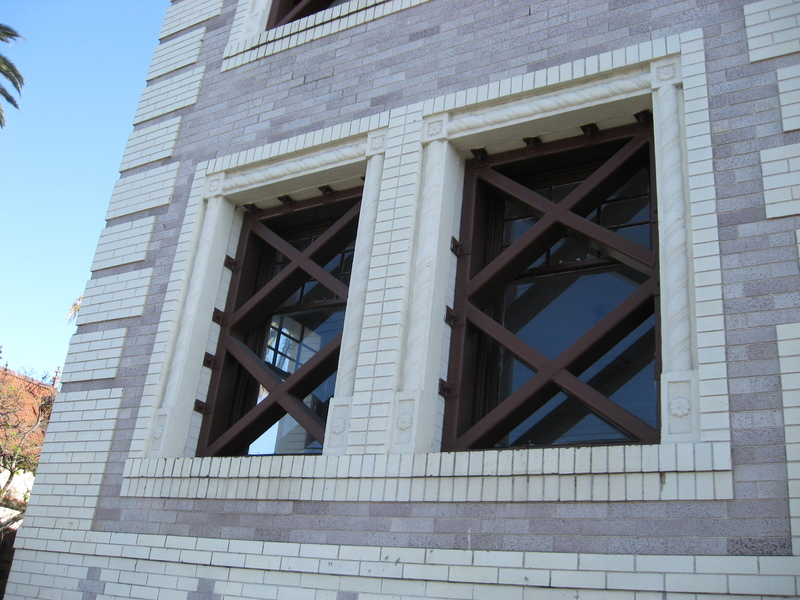 It’s not often that one sees a building with such obvious reinforcement on it. 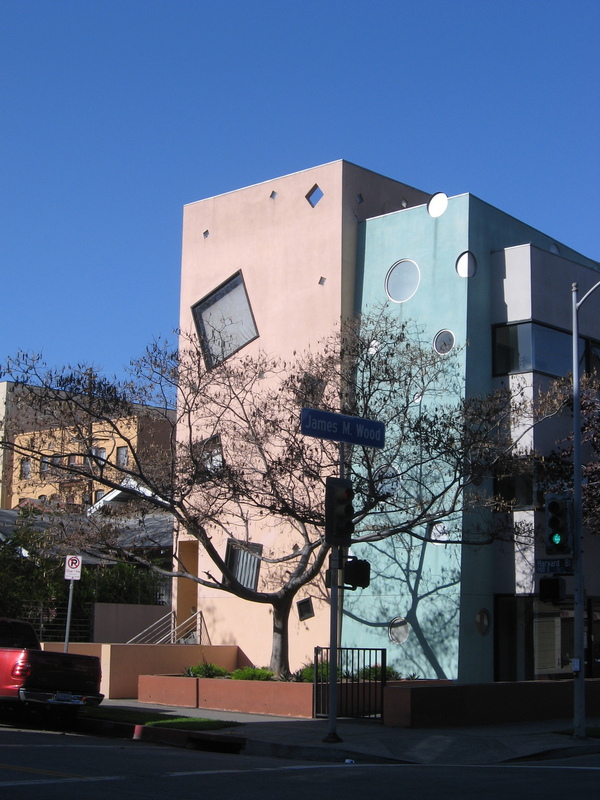 And a little farther down the road, we saw another building with some odd windows. We were wondering where they get blinds for windows that are built at odd angles like that. When we got to the Park La Brea gates, a quick turn south took us to the corner of Ogden Dr and Wilshire Blvd, and there it was. They had a high wall around the site, so we really couldn’t see in. But I was able to reach in through the gate with my camera to get some pictures. Probably about the most interesting thing to see in there was the backhoe that was completely black from digging through the tar that apparently must be everywhere in the ground around there. I wonder what it’s like for people who live in that neighborhood. What happens if you try to grow a garden in the back yard? 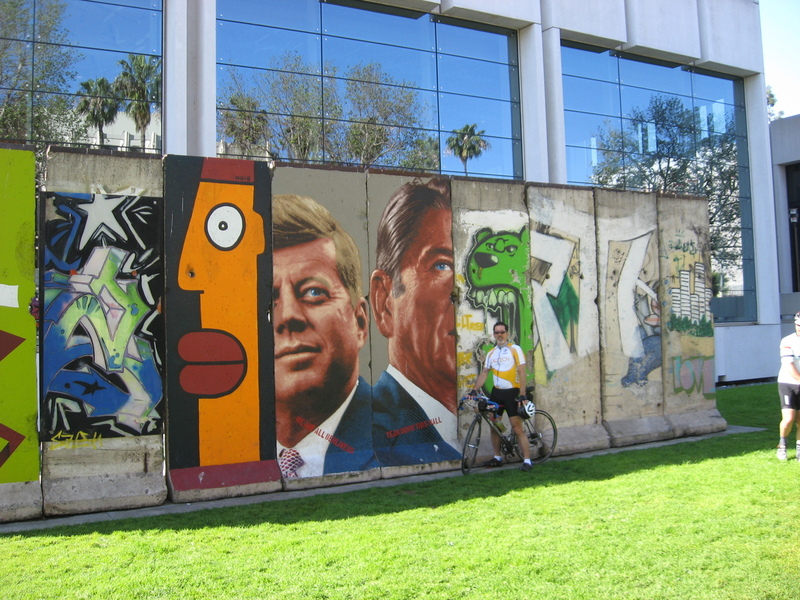 Since we were there, we went next door to the lawn in front of the Variety building, where they have a section of the Berlin Wall. We’d come out to see this once before. Then we went across Wilshire to LACMA to see the Big Rock. And after that, we headed back east to Larchmont Village and our snack stop at Noah’s Bagels. 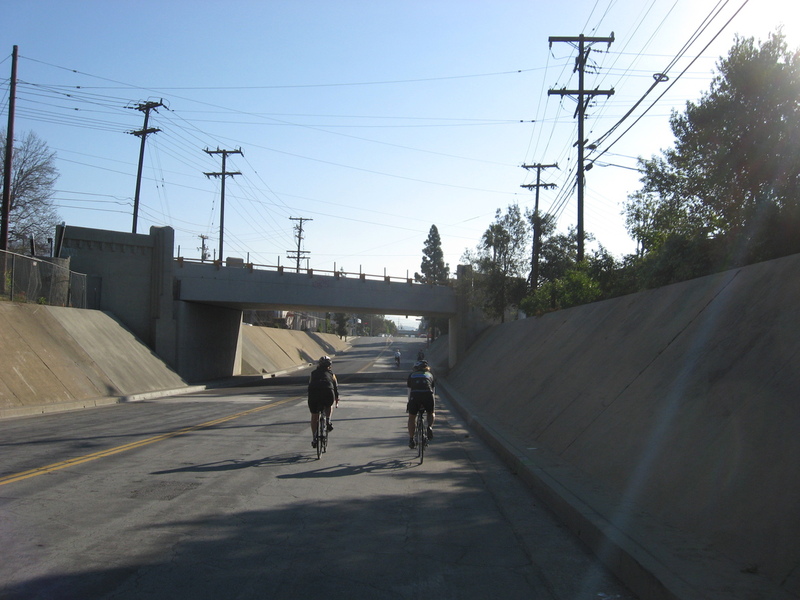 And then we rode home, taking York Blvd across Highland Park for a change. They put in a bike lane, and that street isn’t so bad any more. Some years ago, the Sunday bike club ride was rained out. This happens from time to time, but that time, it happened when we were in West Hollywood, which is about 20 miles from home. We managed to make it two miles or so back into Hollywood, and then take Metro Rail home to Pasadena. After that, I made up a route for us to ride on days when the weather is questionable. I called it the “Metro Rail Tour”, and it’s a route from Pasadena and through Los Angeles that manages to never be more than a mile or two from the nearest Metro Rail station. That way, we have an exit strategy in case it starts raining. We’ve done this route a number of times over the last few years, but today was the first time we had to actually use the exit strategy. It was overcast, and the skies looked like rain. 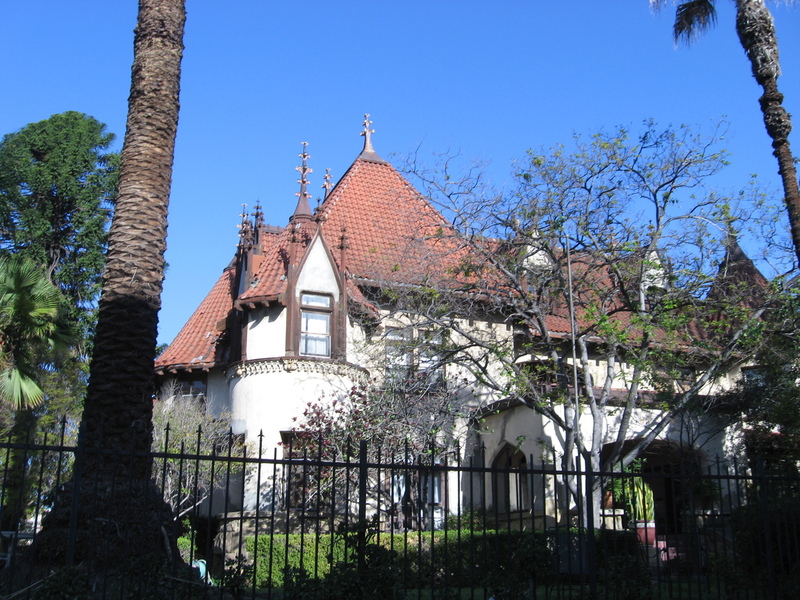 We headed south, down Sierra Madre Blvd to Huntington Drive (Near the Metro South Pasadena station). 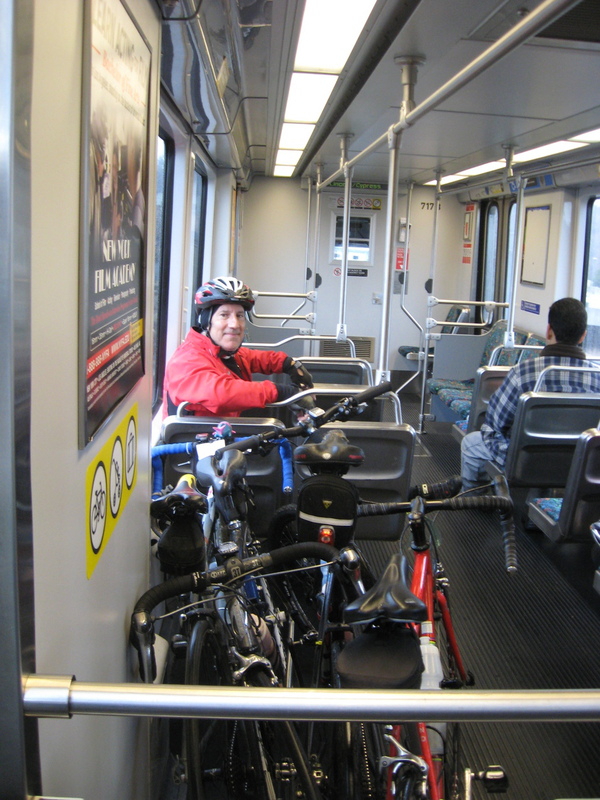 We took that into downtown Los Angeles (Chinatown Station and Union Station). 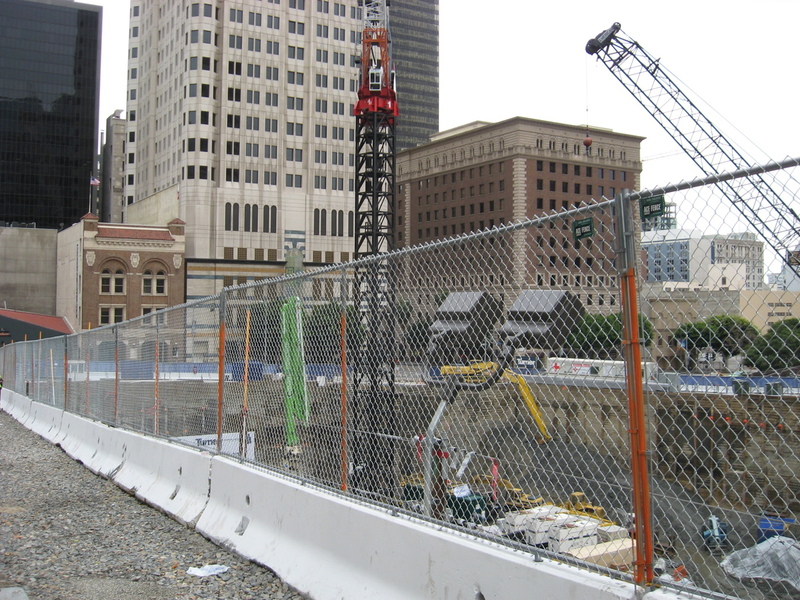 In downtown, we took a short detour to see the site of the new Wilshire Grand Hotel (Next to the 7th St/Metro Center station). 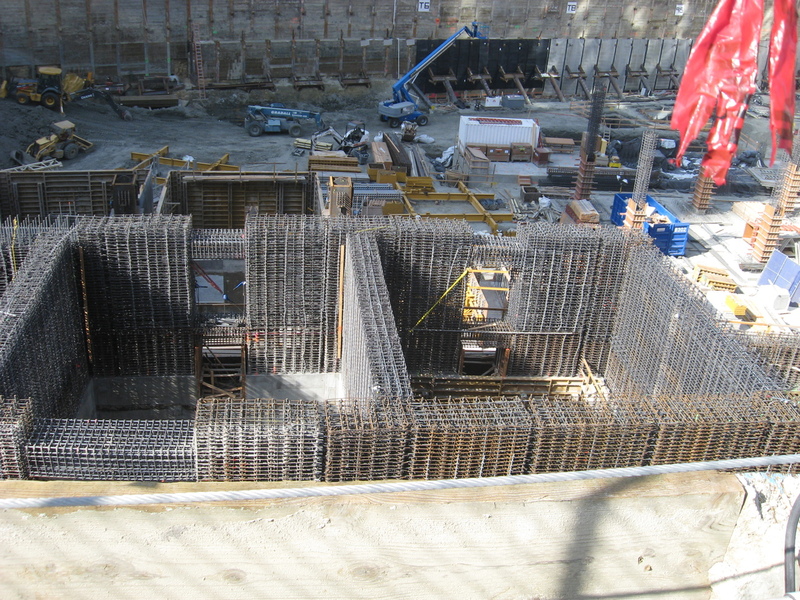 This was in the news last week, when they poured something like 2,000 truckloads of concrete in 20 hours to make the foundation for the new 70+ story building. 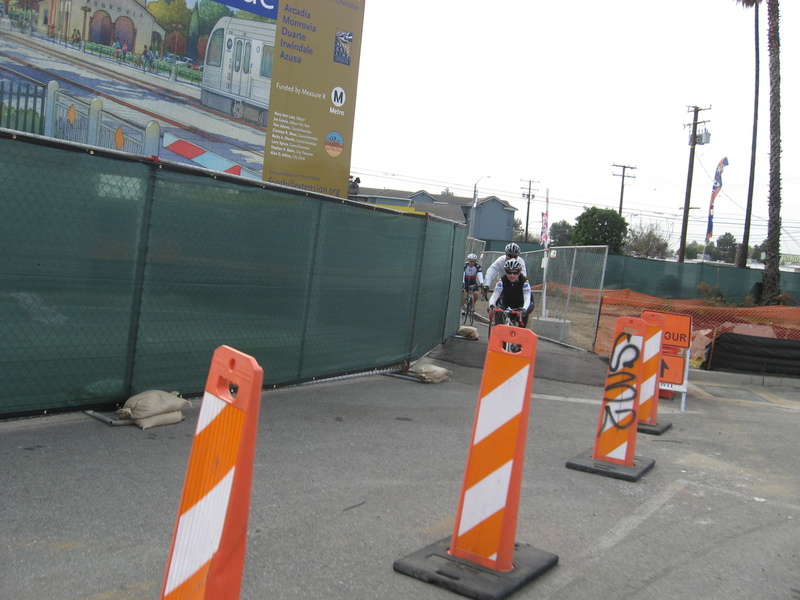 When we got down by USC (Expo Line 23rd St Station), we felt a few raindrops, but that stopped after a few minutes. So we continued on. We turned north up Harvard Blvd (and the Metro Wilshire/Normandy Station), and then west to Larchmont Village, which is between the Metro Wilshire/Western and Hollywood/Vine stations. We had some snacks and then headed for home. 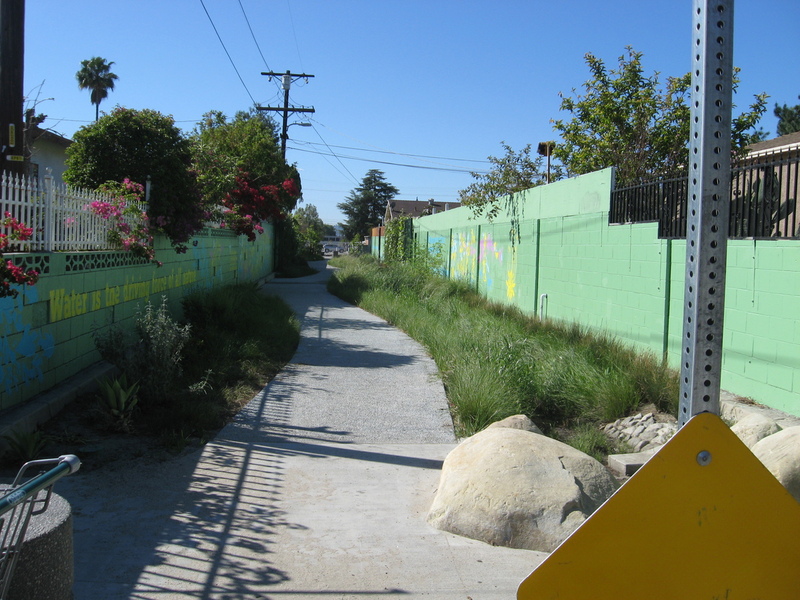 The route back was along 4th St and 7th St, which parallels Wilshire Blvd and the Purple Line subway. Then we turned north into Echo Park. At that point, we were about as far from a Metro station as we would get on this route. And, of course, that’s when it started to rain. We pulled over for a quick conference under an overhang. 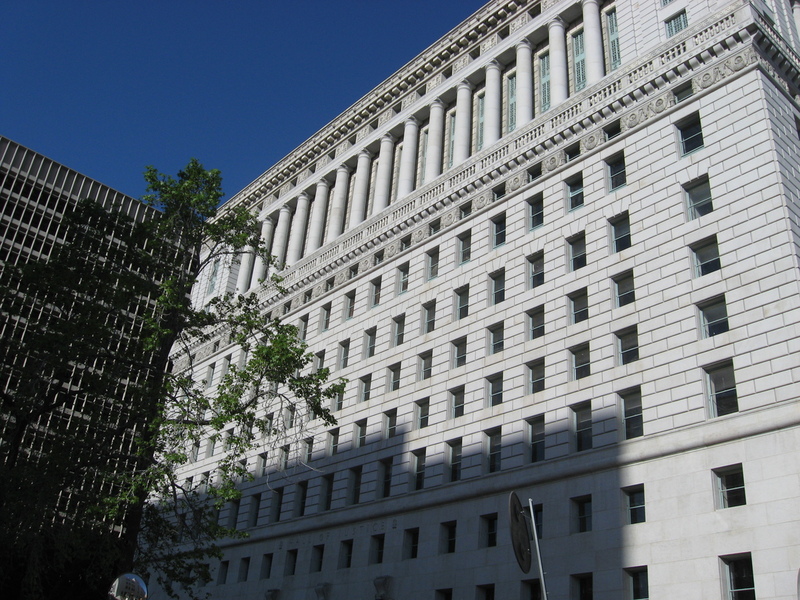 I had a look at the map, and I saw that we were only about 1 mile from the Metro Chinatown station. So we worked out how to go, and we rode there through the rain. 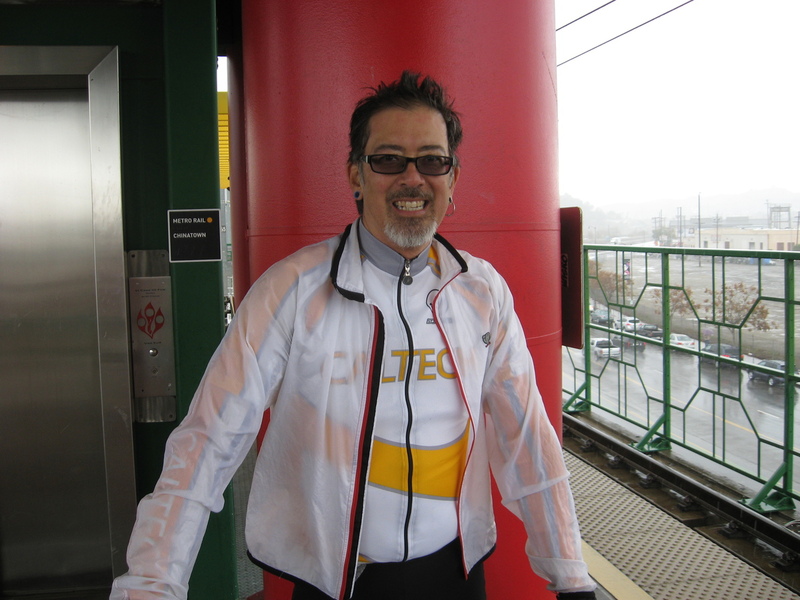 It was miserable riding in the rain, but knowing it was just a short distance helped a lot. Once we got there, we got on the train and headed for home. Even though I hate getting rained on when I’m riding, I was glad that my route with the built-in escape worked well. And once the Metro Gold Line Extension is finished, we’ll be able to make a Metro Rail tour heading east for days when it might rain. 32 miles. Would have been 44, but that’s how it goes. Today’s bike club ride was yet another sightseeing ride. 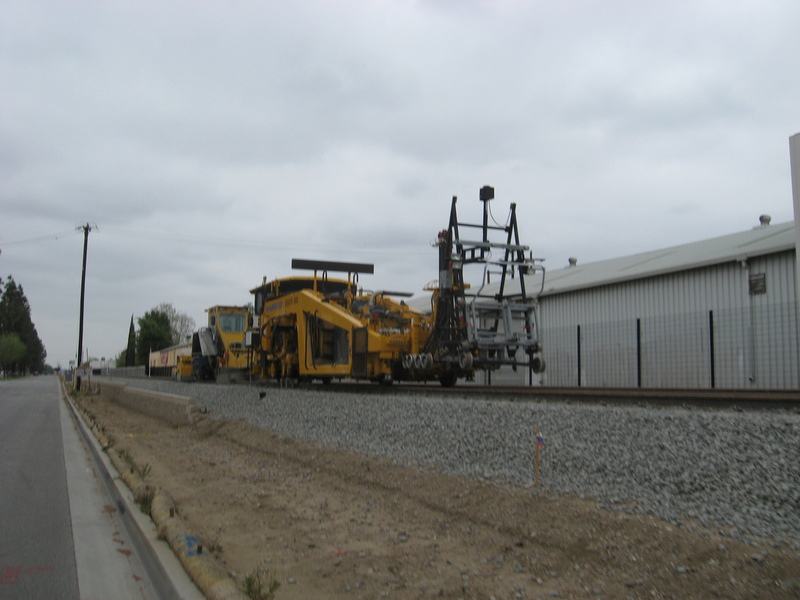 This time, we toured the San Gabriel Valley to visit the construction sites where Metro is building the Gold Line light rail extension from Pasadena to Azusa. 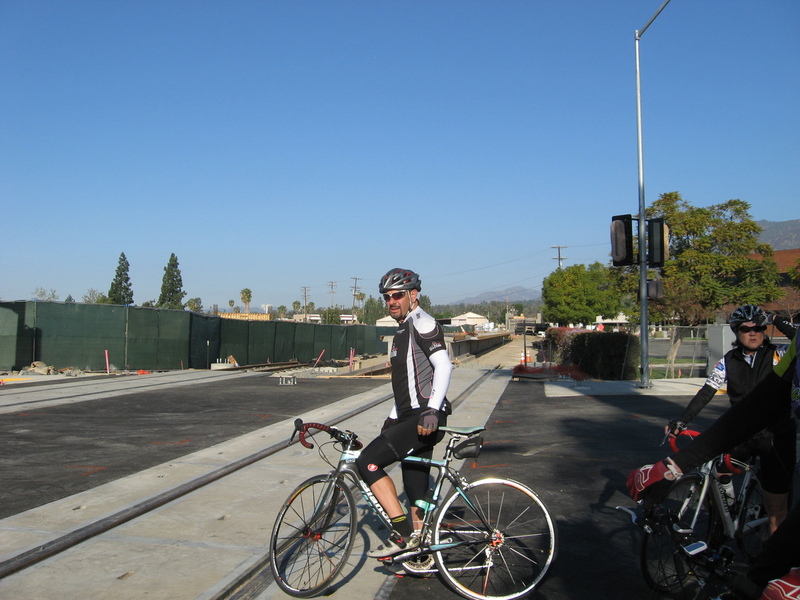 The first stop was the Arcadia station being built at 1st Ave and Santa Clara St. On the way there, we saw the new bridges they built for the tracks to go over Colorado Blvd and Santa Anita Blvd. The station is coming along pretty well. Continuing on to Monrovia, we saw the beginnings of the Metro station there. It’s right by the old Santa Fe depot, but there’s not very much built yet. 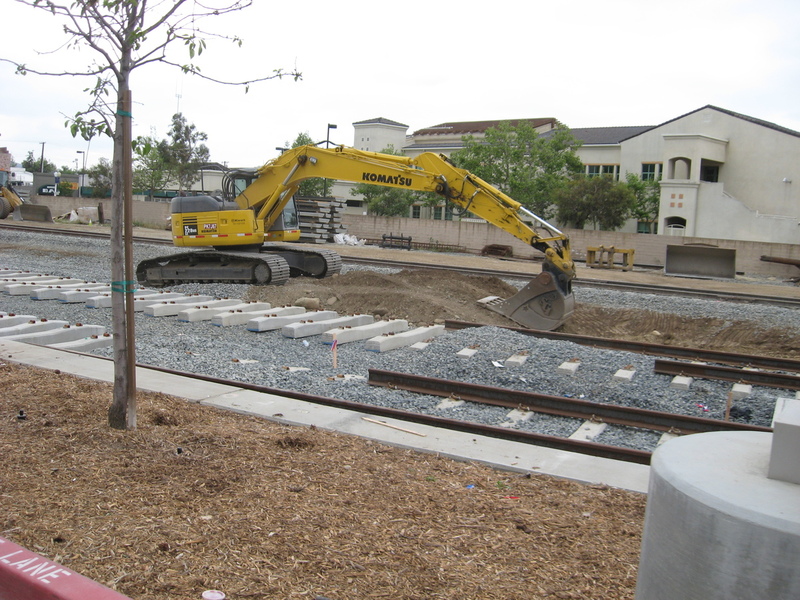 We also saw the beginnings of the maintenance yard for the light rail line that they’re building in Monrovia. 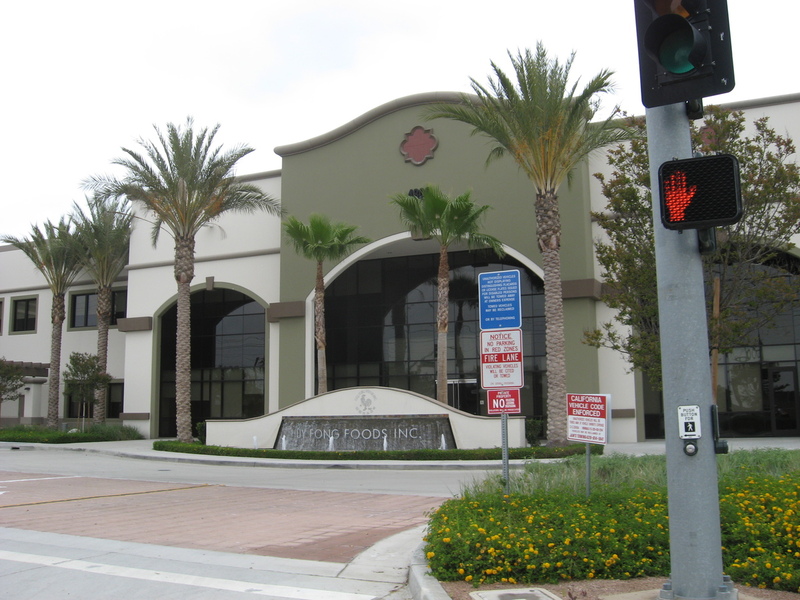 The station for Duarte is right across the street from City of Hope, and it’s looking pretty close to being finished. 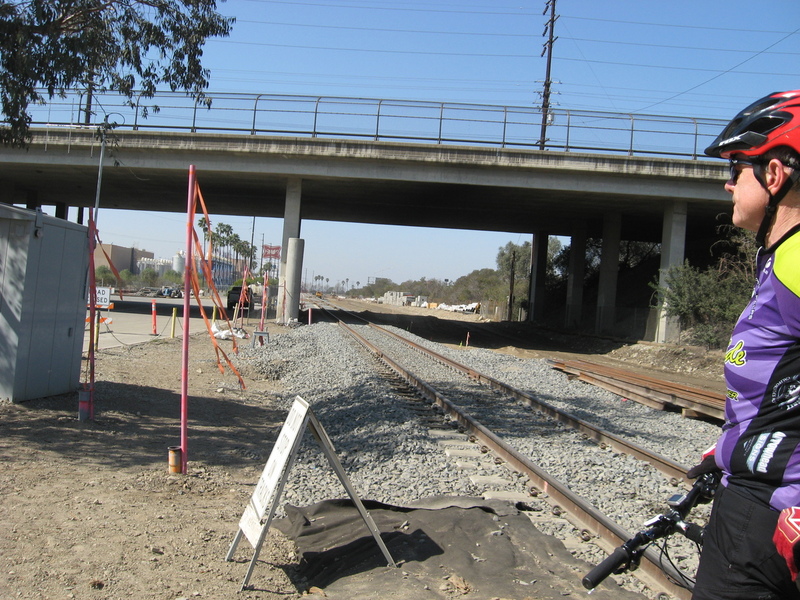 This is just before the tracks cross over the San Gabriel River, so we turned north to get to the bike path bridge by Encanto Park. We took that across the river and into Azusa. The big Santa Fe railroad bridge over Foothill Blvd is being rebuilt. The old bridge is a single track, so they are building essentially two more bridges on either side of it. 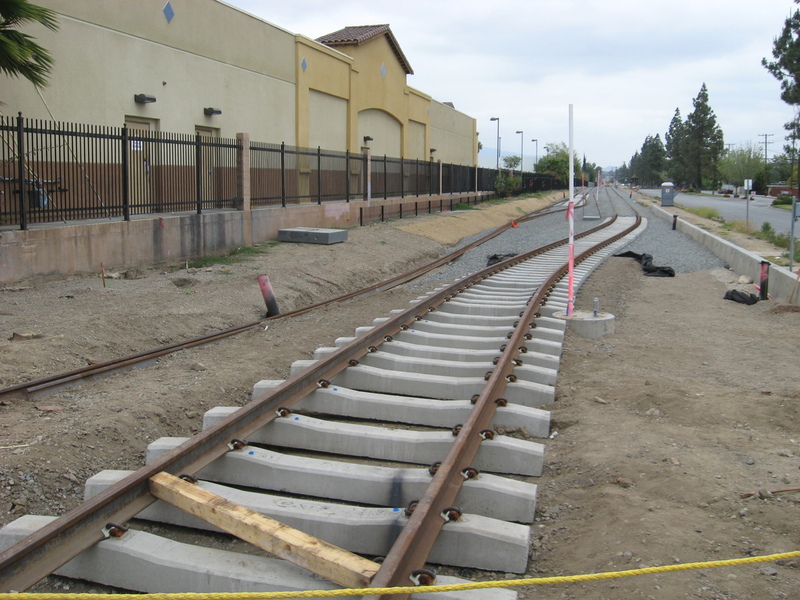 This is because the part of the Santa Fe line from Irwindale and east is still an active freight line. 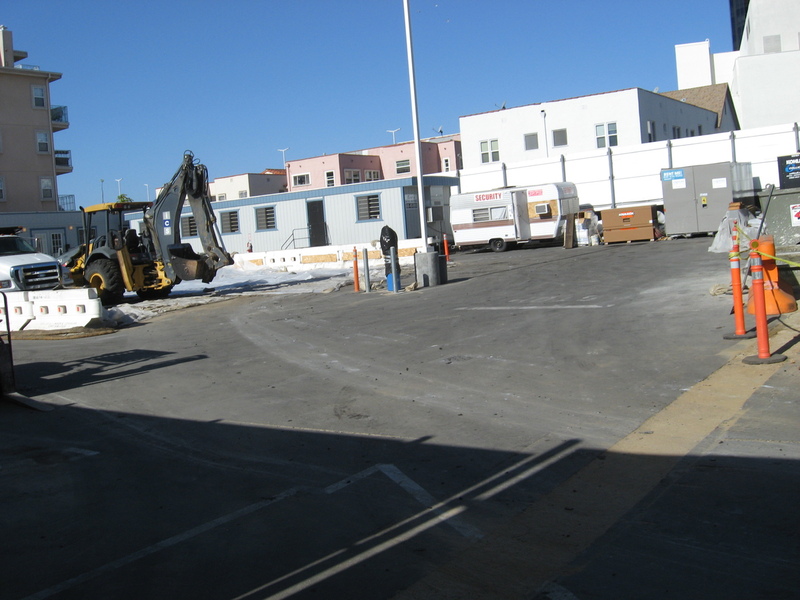 The freight track is being relocated to the side a bit to make room for the double-track light rail line. 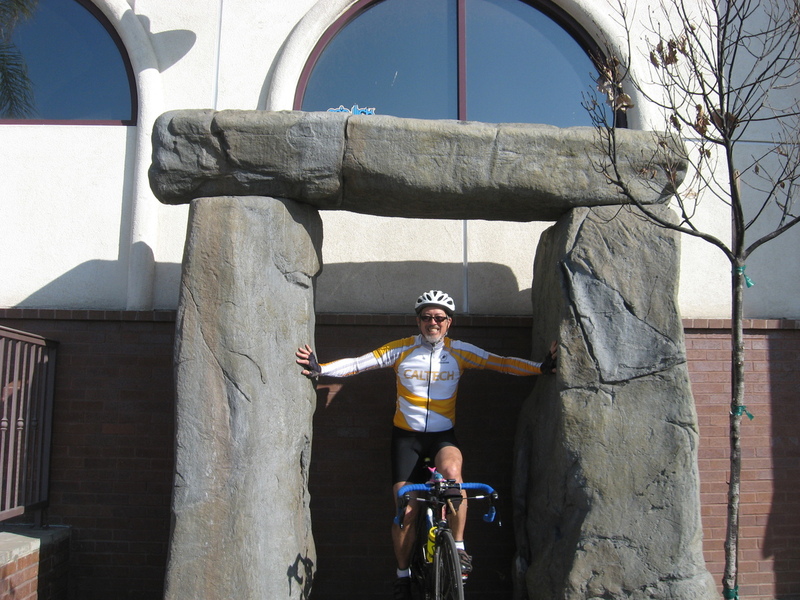 I stopped for a photo-op at the little Stonehenge-like thing on the corner behind the CVS store. 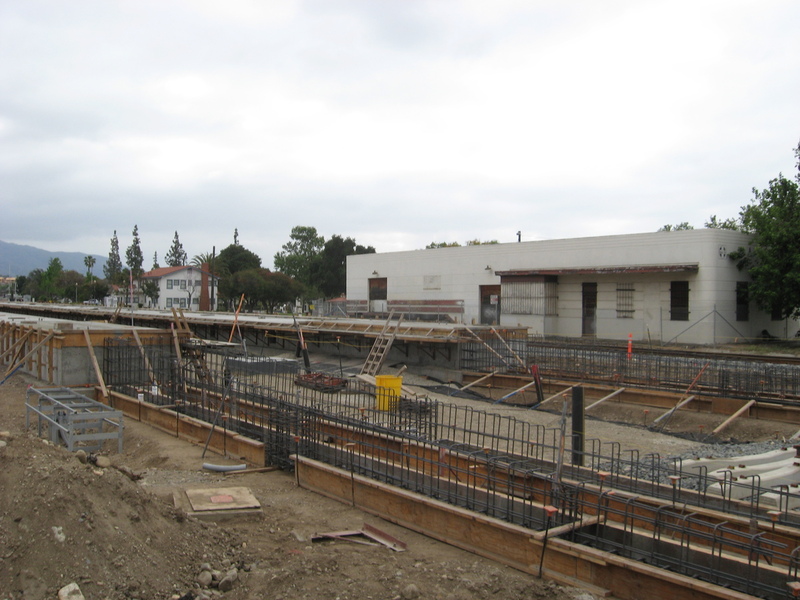 Then we went up a block to where they are building the first of two stations for Azusa. 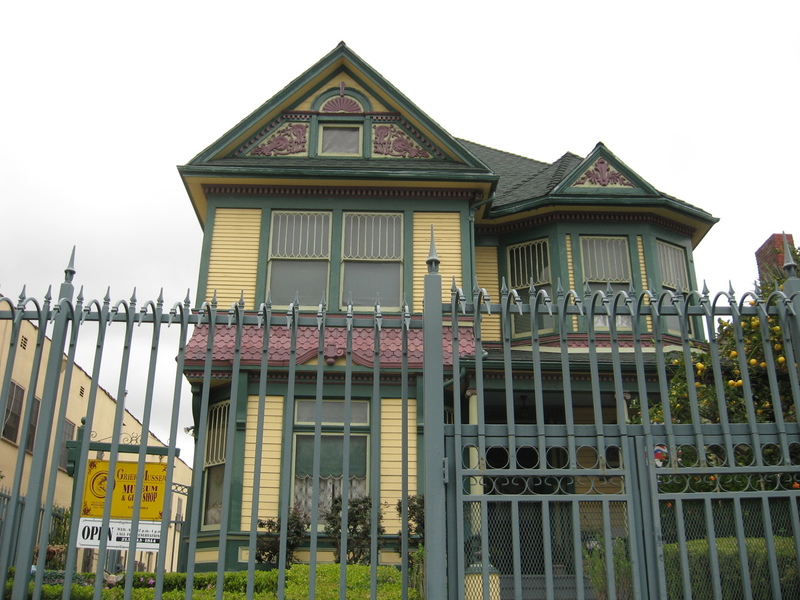 This one is being built next to the old Santa Fe depot. 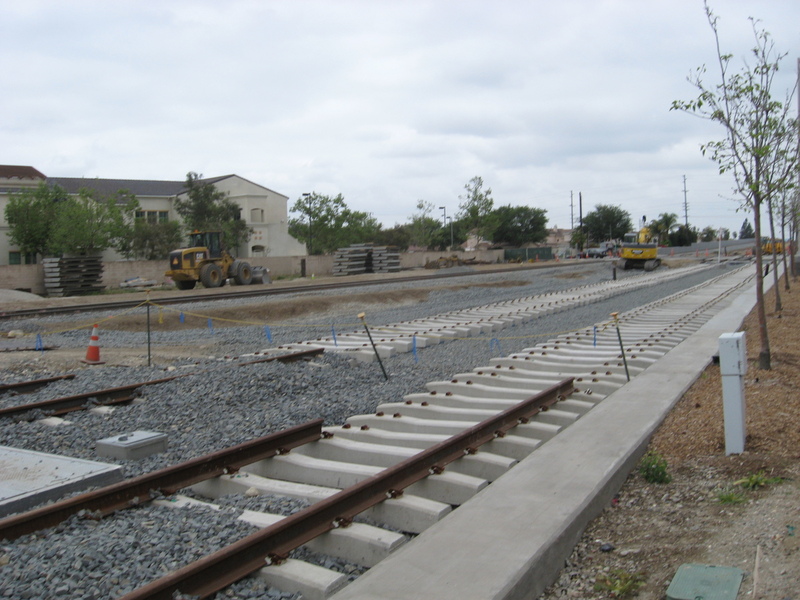 The second Azusa station is the last one being built for this phase of the light rail line. 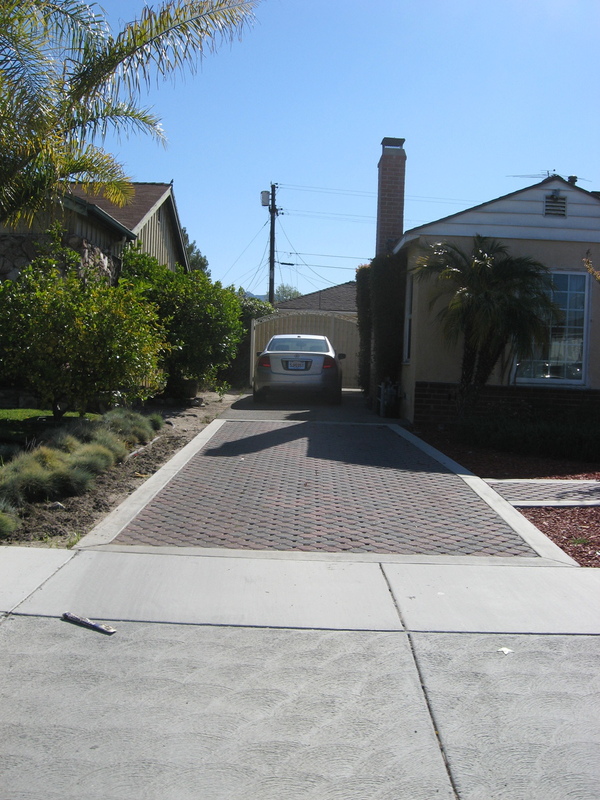 It’s right on the border with Glendora, and it’s right in between Azusa Pacific University and Citrus College. I guess that was the idea. There’s a big sign there, but not a lot of activity yet. 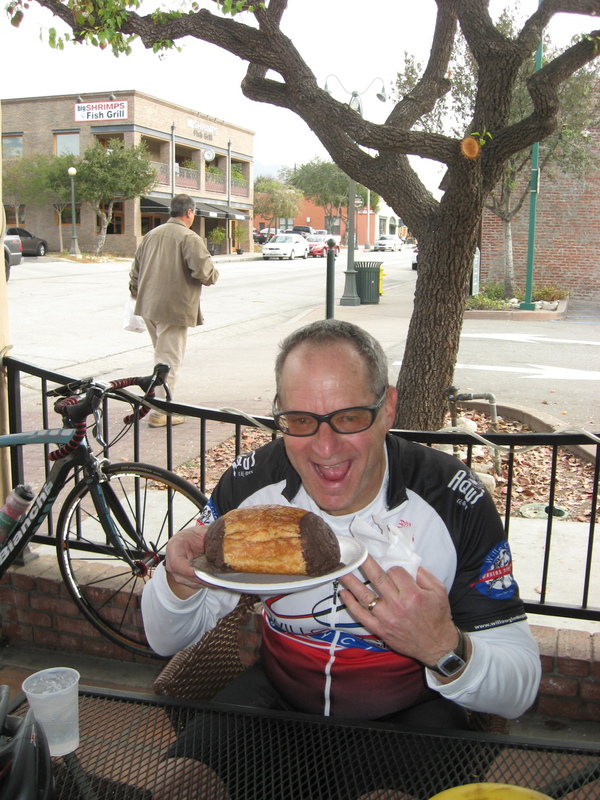 Our snack stop was at the Corner Bakery in San Dimas. We’ve been by there a hundred times and never even noticed that it was there before. But it was right by the road we ride on a lot, so we’ll probably be stopping there again in the future. 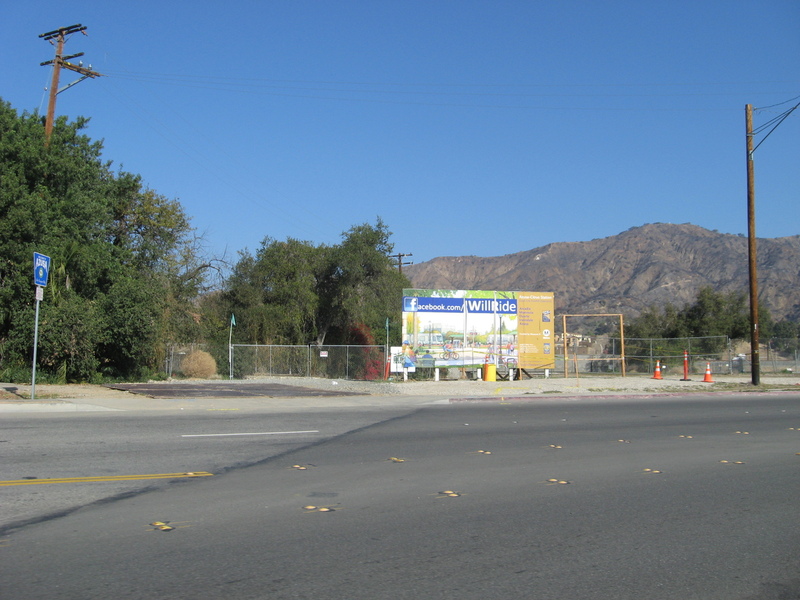 We rode Gladstone St all the way back to Irwindale, where we took one little side trip to see the site of the Irwindale Metro station. There wasn’t much there, but the big stacks of concrete railroad ties indicate that they’re going to be laying track there soon. That was the whole of our Metro light-rail adventure tour. We’re going to go on this ride again in a few months to have a look and see how much progress they’re making. I’m a big fan of funny art installations, and that’s basically what this is. I figured it’s probably not going to last too long, so I made plans to go see it today with the Sunday morning bike club group. 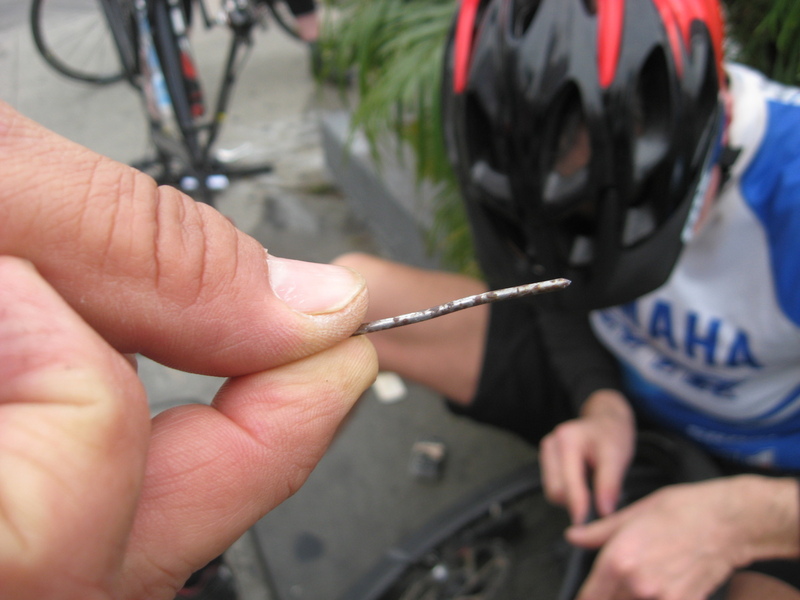 We rode out towards Hollywood by our usual route, only stopping once in Highland Park so Michael could fix his tire after running over a nail. 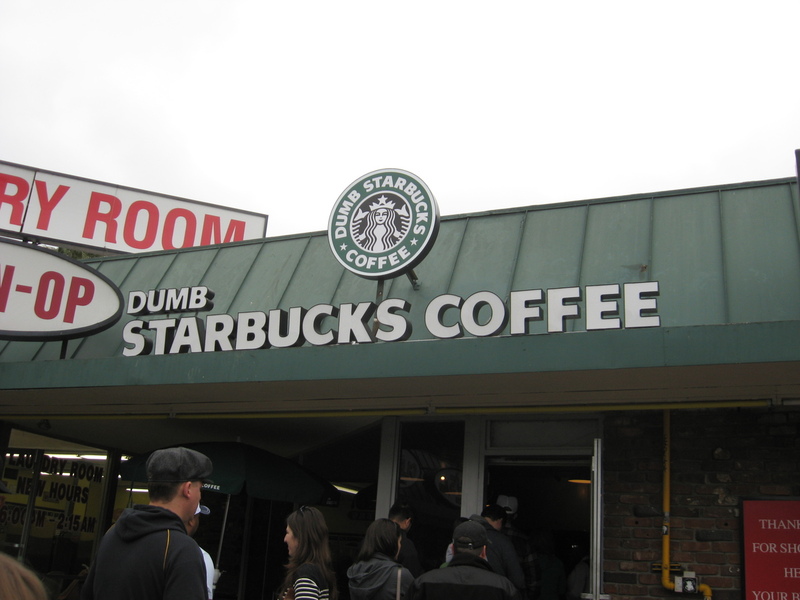 And when we got to Dumb Starbucks, we saw that the word had gotten out. There was a line out the door and across the parking lot. And pretty much everyone thought it was pretty hilarious. Jeff and I even saw our stair-climbing friend Amber there. As much as we wanted to see inside the place, we didn’t have time to wait in the line. So after a few pictures, we moved on. 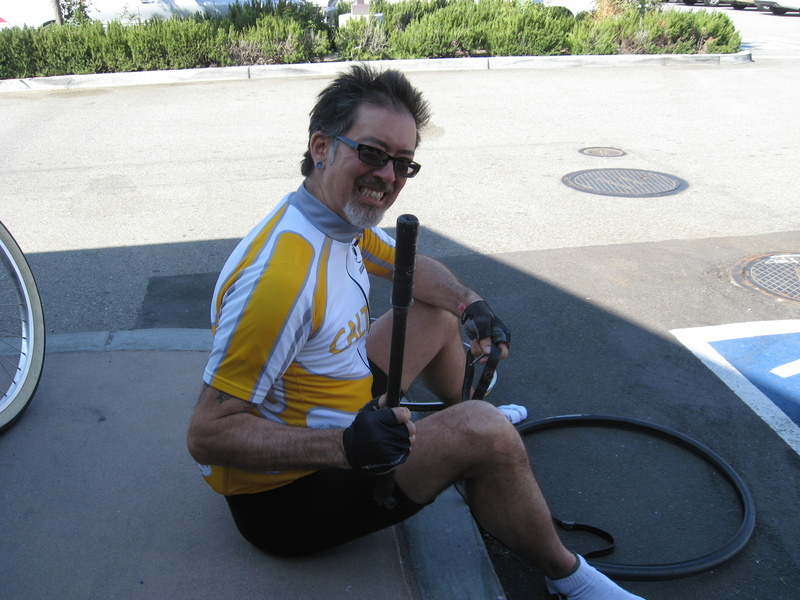 We rode across Hollywood and then down into Larchmont Village for bagels at Noah’s. After that, we came home by the usual route. It was an amusing ride. Reminiscent of the time we went to see the Kwik-E-Mart, and the time we rode to see Wilshire Boulevard dressed up as Tokyo, or 4th Street dressed as a New York City tunnel toll plaza. 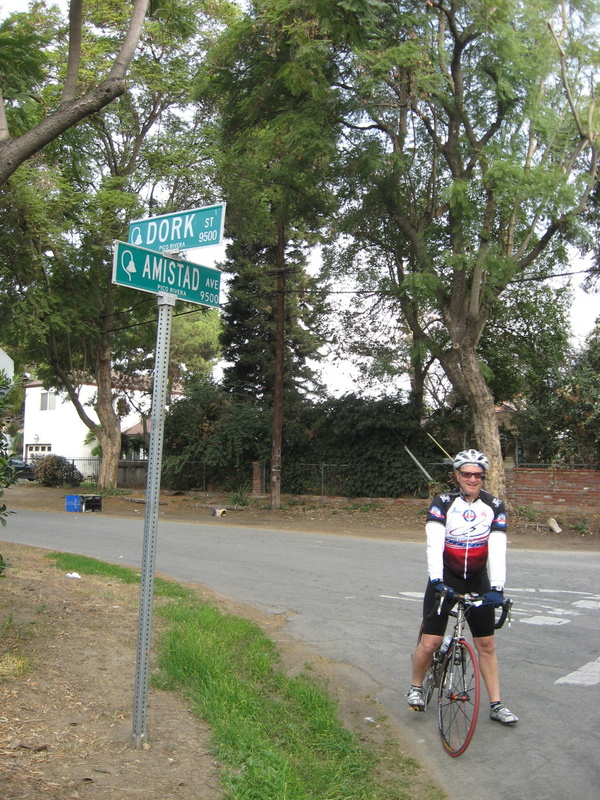 Today’s bike club ride was the ‘Random Whittier Ride’. Just a meandering route that goes down to Whittier and back, with a snack stop at Merengue in Monrovia. It was cool and overcast, but not a bad day for riding. 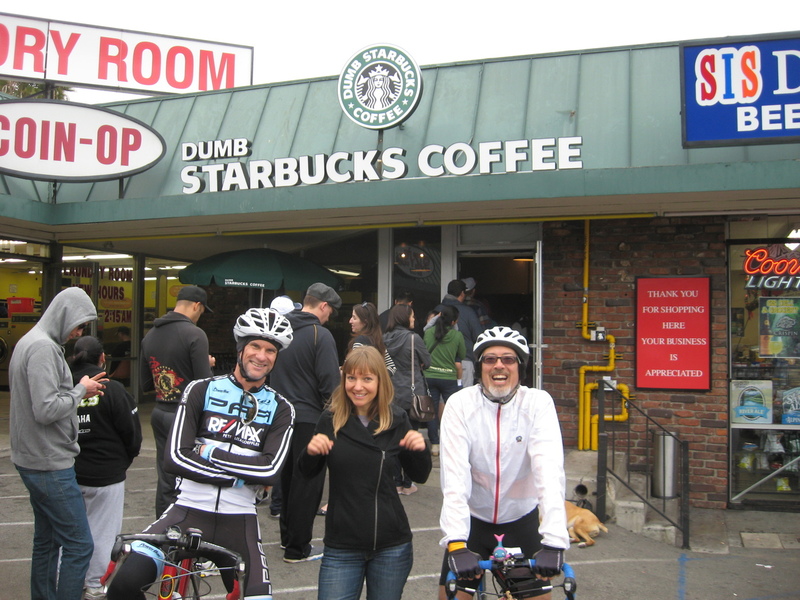 We stopped briefly in Pico Rivera, since this was Jim’s first time riding this route with us, and so we had to do the obligatory photo-op at Dork St. And that was about it. It was a pretty uneventful ride. 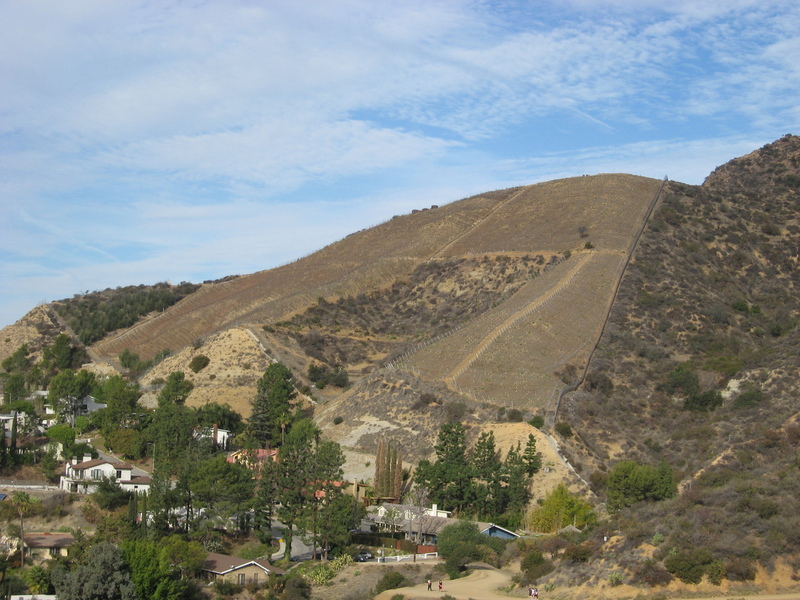 Last week, I read an article in the L.A. Times about a guy who owns some of the land on Mt Lee, near the Hollywood sign. And how he’s planted a vineyard there. The article said the grapes were planted in 2001, and given the number of times we’ve been up that way, I was surprised that we never noticed it before. So this Sunday’s ride was to go see it. It was a nice day for riding, and we headed out by our standard route to get to Hollywood. 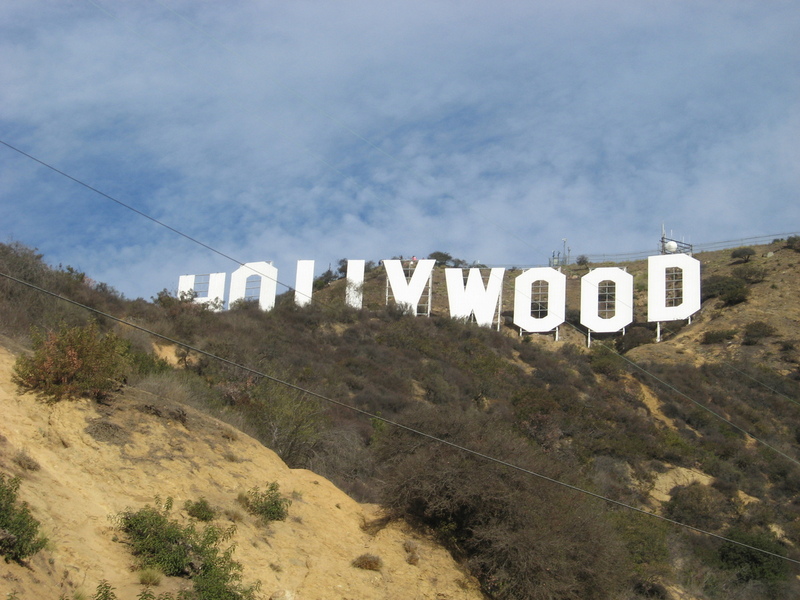 We rode up the hill in Beachwood Canyon, and stopped at the Hollywood sign, and then we headed down toward the reservoir. Then, looking back up the hill, we saw the vineyard. It was big and obvious. 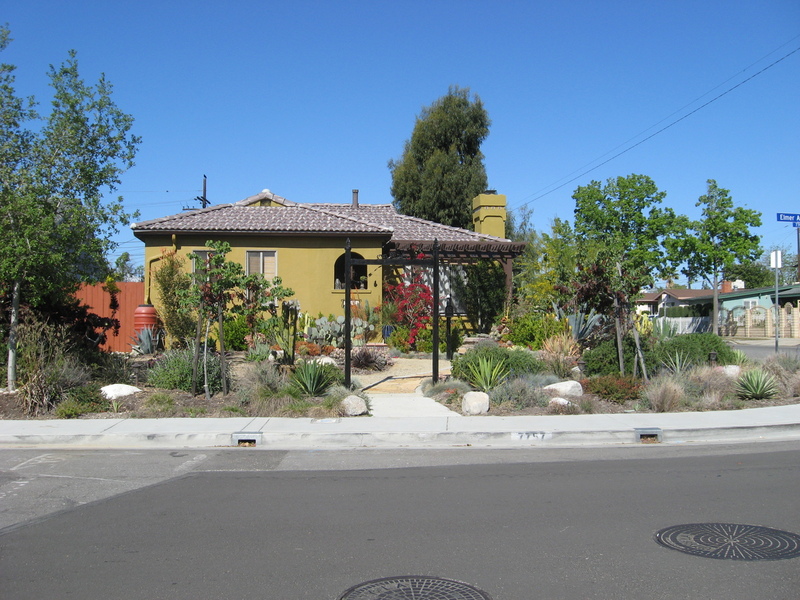 And it looks like a tremendous amount of effort went into planting it, and maintaining it. We stared at it slack-jawed for a few minutes. And that was that. We continued on our route, going up and over the hill into Burbank. We stopped for snack at Priscilla’s, and then headed home. It was a pleasant ride.